Quarries serve their communities with construction and landscaping materials. All photos by Andrew Alden. Stony Point Rock Quarry is a working business in Cotati, busy making money and serving its community’s needs from the humblest of materials. Today, you can’t open a quarry without a plan for shutting it down—covering the scars and fixing any pollution. However, the Bay Area is dotted with older quarries, some in your own neighborhood, that closed without full remediation. I won’t be addressing the problems of mines (like mercury mines), whether underground or open-pit types. Those foster chemical activity that threatens the environment and they require special care. Today I’ll show you some simpler quarries with fairly benign footprints. They can be turned into assets, and they offer some geological interest as well. To my knowledge, we don’t have any dimension-stone quarries around here, the stereotypical kind (think Carrara, or Vermont) where blocks of solid stone are cut from pits. Our old quarries produced limestone, crushed stone, and sand and gravel. Let’s look at an example of each. 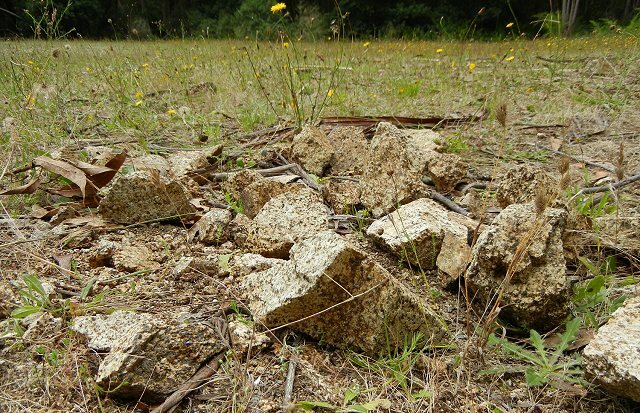 Limestone: The former Cowell limestone quarry sits south of Concord in the Lime Ridge Regional Preserve. It’s accessible from Walnut Creek and from Concord. According to the California Division of Mines, the Cowell quarry was opened in 1908 and closed in 1946, “at which time depletion of local limestone reserves and loss of rail facilities forced a permanent shutdown.” We may also surmise that the end of wartime conditions affected the market. Not much has been done to the pits, and you can enjoy two great features of the space at your leisure. The first is the view, or views, including this prospect of the Briones Hills. The second is the stone itself. 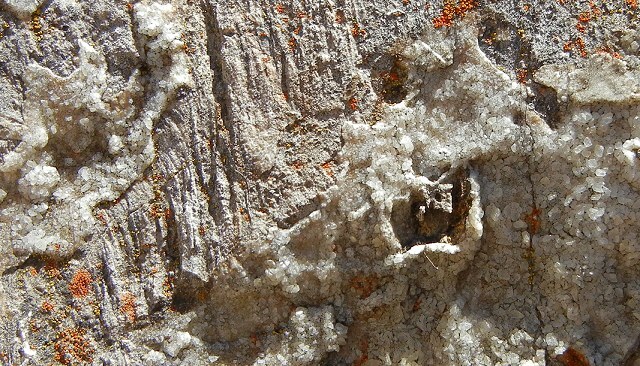 Apparently the regional rock, sandstone of the Domengine Formation, featured a thick layer of travertine (hot-spring) limestone. In the rubble you’ll see sheets of calcite crystals and intricate layering from that setting. It’s safe to assume that no collecting is allowed. Limestone from this site was roasted into lime and used to make cement (as was the Calera Limestone). Other Bay Area limestone quarries served sugar refiners, foundries and many other industries. 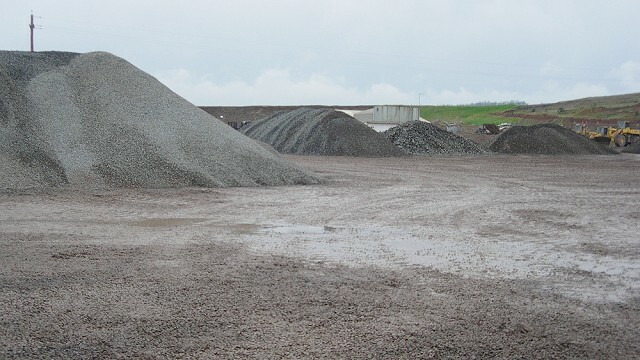 Crushed stone is a necessity of engineering: road beds, runways, and foundations of all kinds use it at many different tightly specified grades. The main prerequisite is sound rock of benign minerals that can be reliably crushed and stay that way without crumbling further into sand. Near the little planned town of El Granada, on the San Mateo coast north of Half Moon Bay, a quarry produced construction stone from a large body of granitic rock, the Montara Quartz Diorite. 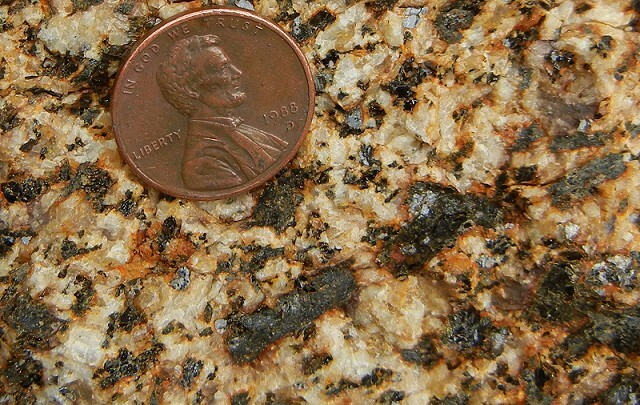 This stone is closely related to the granite of the High Sierra, and plate tectonics brought it here. It’s full of flaky biotite (black mica) and lath-shaped crystals of hornblende in a setting of white quartz and feldspar. Iron from the black minerals has stained the stone. The stone was used locally in highways and the Half Moon Bay Airport, especially during World War II. It then sat quietly until the landowner sold it in 1995. Now called Quarry Park, it serves several low-key uses: a playground in front, woodsy trails in back, and an amphitheater-like space in the former pit that looks suited for frisbeeing or picnics. A viewing platform has been built on its top edge for occasions when the sun comes out. 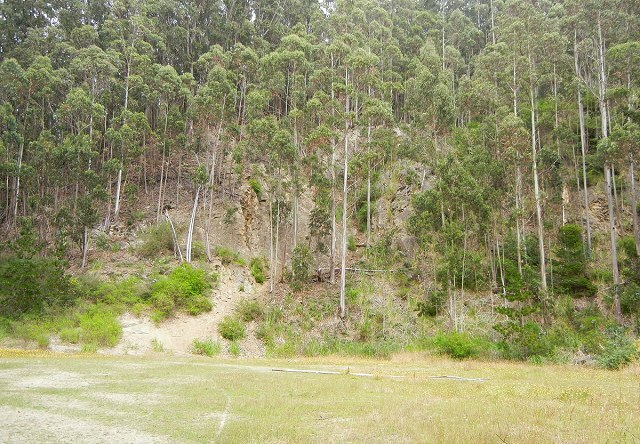 There’s still work to be done, of course: eucalyptus and other invasives are rampant, for instance. Also the stone itself is suspect. Natural fracturing from our long history of faulting (the site is only a kilometer from the San Gregorio fault zone) has made the rock easy to mine, but prone to crumble. This is not a place to linger during an earthquake. Sand and gravel are also mainstays of civilization. In the Livermore valley, enormous beds of river gravel were exploited, starting in 1923 with Henry J. Kaiser, and they continue to produce today. Kaiser Industries donated one of its oldest pits, along the Arroyo del Valle, to the East Bay Regional Parks District. 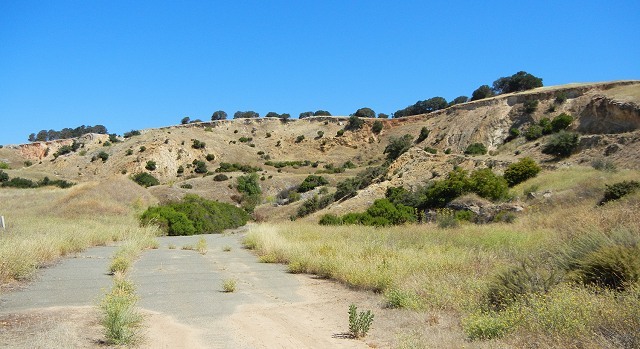 This became the mixed-use Shadow Cliffs Regional Recreation Area. You can swim and fish in the lake, birdwatch in the riverine habitat, geologize in the gravel and enjoy the views, which include Mount Diablo and the neighboring pits. Everything in the former pit became something useful, from fine sand to “river rock” to the head-sized boulders that constitute rip-rap. 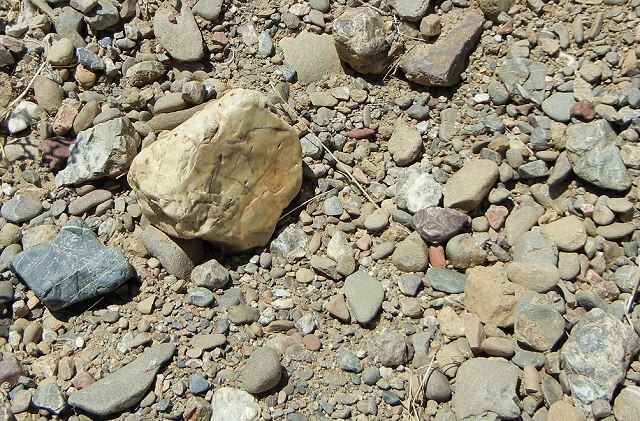 A close look at the raw material reveals a wide range of rock types, eroded from the Diablo Range and East Bay hills. At the east end of the pit the sediments can be seen with their original layering. They represent the heritage of a lengthy time of vigorous rivers and plenty of rainfall. Perhaps the park will grow as more gravel quarries mine out their claims here. Parks aren’t the only thing that old quarries are good for. 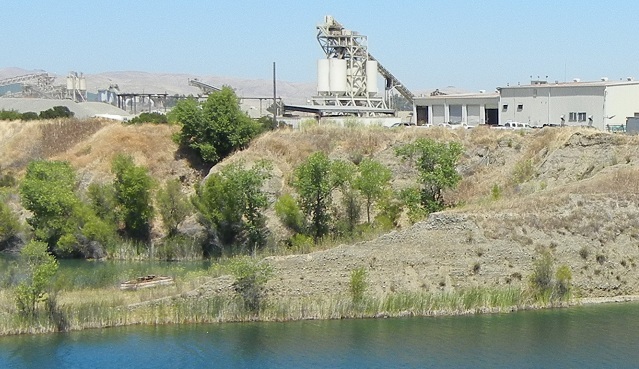 The former Bilger quarry in Oakland, at the intersection of Broadway and 51st Street, produced construction stone and aggregate for the growing city starting a century ago. 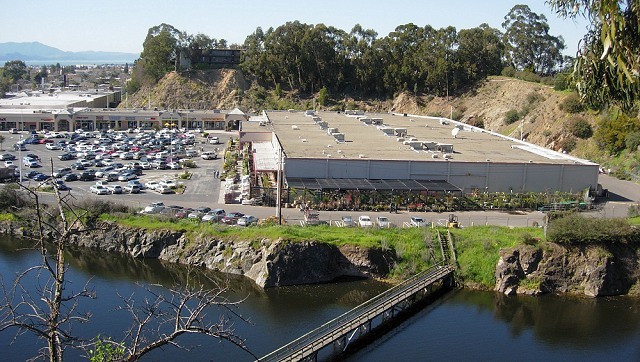 Now it houses a shopping center, with the California College of the Arts perched above it and a deep water-filled pit at its east end. The Catholic cemetery, from which I took this photo, is not likely to be torn down to fill the pond, so the pit appears to be here to stay. Fortunately the stone here is strong. Other former quarries encompass homes at Larkspur Landing in Marin County and around Telegraph Hill in San Francisco. There are even churches sitting in them, truly looking at the stars from the gutter.